Many different designs of toilets, wash basins, urinals and bidets Renova Nr.1 Plan is open to all wishes. 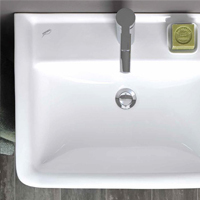 The intelligently designed wash basins effectively protect against splashing water and offer storage spaces on the left and the right side on demand. The matching Renova Nr.1 Plan WC is very easy to clean and with 4.5 / 6 l highly water saving. Regardless whether Renova Nr.1 Plan wash basin, bidet, WC or urinal, all Renova Nr.1 Plan ceramics are available with the particularly easy care KeraTect coating. In harmony with the ceramics, there are also Keramag Renova Nr.1 Plan mirror cabinets available, so that you can furnish your bathroom preferably from one source.